I was doing research on haiku and other forms of Japanese poetry recently when I came upon the sedoka – a very, very early poetic form. Although the sedoka is rarely seen these days, it’s been around since Japan was still using Chinese characters in their written language! I had played around with the form a few years ago,but had forgotten about it until now – so I’m grateful for this ‘accidental’ inspiration. Rather than getting into a long explanation of what a sedoka is, I invite you to visit THIS LINK to learn more. Simply put, a sedoka is made up of two tercets (3-line stanzas) which ‘converse’ with each other; that is, the first sets up a scene and the second responds to it by connecting the reader to an emotion. In this way, a sedoka is sort of a cross between a haiku and senryu – although both of those forms are much, much more recent creations than the sedoka. Probably not the best sedoka ever written – certainly not on par with Kakinomoto Hitomaro, the Master of the sedoka – but I’m happy with it as a first try! Looking for more poetry? My friend Amy at The Poem Farm is hosting Poetry Friday today! And if you’ve not yet entered my drawing for a free copy of Don’t Ask a Dinosaur (POW! Kids Books, 2018), be sure to check out this past Tuesday’s post! I’m celebrating Dinosaur‘s one-year birthday with a look at the most common questions we get from kids and teachers, so I hope you’ll leave a comment to be entered! It’s been a busy couple of months for me, with manuscripts getting written and revised, conversations with editors, manuscripts being again…I’ve even started two new projects I hadn’t planned. (I love it when that happens!) Something else that’s been keeping me busy is preparing for a poetry reading in Warner, NH two weeks from this Sat. night! Doors will open at 6:30pm, to allow attendees to view the pieces before the second event begins at 7pm: a poetry reading with two poets from the Granite State, Deborah Brown and L.R. Berger, and Yours Truly. I’m truly honored to be a part of an event with such highly-esteemed writers as Deborah and L.R. We’ll each spend about 20 minutes or so reading and discussing our poetry, and time will be available for questions afterward. So today, I thought I’d dust off my very first published children’s poem – which is more of a YA poem – which I’ll be reading. If you’re in the New Hampshire area April 27, I hope you’ll stop by! You can click HERE for the Facebook Event page for more info…and for more poetry, please visit Live Your Poem, where my friend Irene Latham is hosting Poetry Friday with an assortment of poems she’s been writing as part of her Artspeak project! NEXT WEEK: I’ll be celebrating the ONE-YEAR anniversary of Don’t Ask a Dinosaur (POW! Kids Books, 2018) on Wed., April 17 – with a chance for you to win a copy of the book! 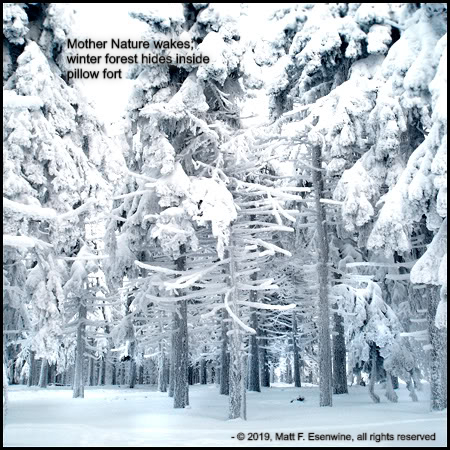 Poetry Friday: Early spring haiku AND the 2019 Progressive Poem is coming! 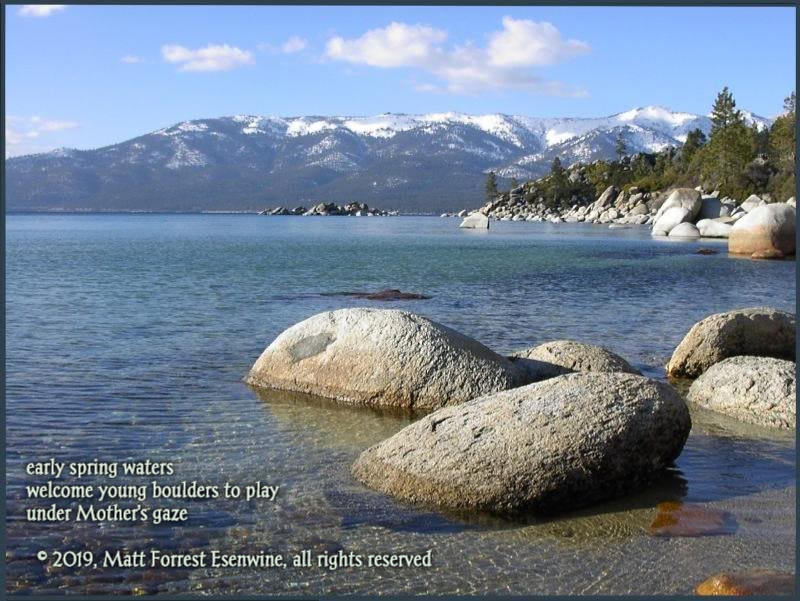 I was thinking of how long winter’s been hanging on (it barely got over 40 yesterday and probably won’t go above 45 today), and thought I’d write something about a late spring…but then I came across this photo of Lake Tahoe from Photobucket entitled “Tahoe Early Spring” and changed my mind! Well, it’s that time of year again – National Poetry Month arrives in just a few days, and so does Irene Latham‘s annual Progressive Poem, an opportunity for 30 bloggers and children’s writers to come together and create a poem over the course of the month. Each year Irene organizes this, and each year it’s a treat to see how the poem begins and grows and develops – and of course, how it ends! This year, I’m excited to once again be a part of it (the only guy in the entire group – how did THAT happen??) and I’m especially honored to be given the opportunity to BEGIN the poem on April 1. What, pray tell, will be the opening line? I have no idea…although I have been kicking around several possibilities in my head. Be sure to check in Monday morning, when it all begins! Congratulations to the winner of a copy of Laura Purdie Salas’ new children’s poetry collection, In the Middle of the Night: Poems from a Wide-Awake House (Wordsong, 2019)…REBECCA HERZOG!! Out of all the folks who left comments on my post a couple of weeks ago (where I interviewed Laura’s “stuff!”), Rebecca’s name was drawn at random. Thanks for visiting, Rebecca, and I’m sure you’ll enjoy the book! Madness!Poetry is down to the wire…my former adversary in the competition, author Lori Degman, has made it all the way to the final round and is up against my former fellow Poet’s Garage member, William Peery! Their poems will be posted soon, so don’t forget to vote in this all-important Final. And if you’re looking for more poetry, head on over to Carol’s Corner for today’s complete Poetry Friday roundup! REMINDER: You have less than one week to enter my drawing for a FREE copy of Laura Purdie Salas’ new book, In the Middle of the Night: Poems from a Wide-Awake House (Wordsong, 2019)! This children’s poetry collection imagines what the inanimate objects inside a home are doing after the lights go out…and between neckties and hair combs and cap-less markers, the house is a much busier place than one might expect. So check out my blog post featuring Laura (well, actually, it’s an interview with Laura’s inanimate objects! ), and leave a comment to be entered in the drawing. Madness! Poetry continues! I got knocked out of the second round in my battle with Lori Grusman – but she is still soldiering on! So log on and check out all the match-ups, then vote for your favorite! Rebecca Herzog is hosting Poetry Friday today at Sloth Reads while simultaneously celebrating national Goof Off Day! How in the world is she going to juggle both of these duties? You’ll have to pop on over and find out! For more poetry, head on over to Writing the World for Kids, where Laura Purdie Salas is hosting Poetry Friday today! It is truly amazing the way some things in our lives just all come together, as if they were meant to be. On June 23, 2018, we lost one of the most important New Hampshire poets of the 20th century, Donald Hall. Among his many accolades, Hall was a former U.S. Poet Laureate and New Hampshire State Poet Laureate, and received the National Medal of Arts in 2010. He had lived most recently in Wilmot, NH, about 35 minutes from where I live, but I never met him; he was rather reclusive in his final years, and while many knew where he lived, few ever saw him. But he continued writing very nearly up to the point he passed, a career stretching some 60 years or so. Well, you see, shortly after Hall’s death, Encircle Publications of Maine decided to publish a poetry anthology to celebrate his legacy, and put out a call to established New England poets to submit original works that were either inspired by Hall’s work or in some way reflected his spirit. 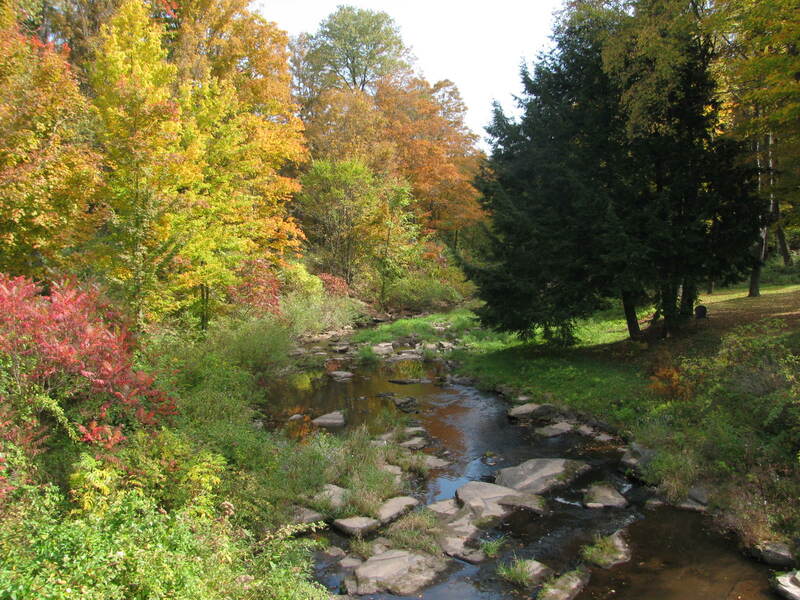 I first began forming the lines of the poem just a mile away from my house, as I walked along a dirt road one autumn. The words, “I kick my dreams like stones in the road” coalesced in my head, and I knew right then I had a poem that needed to be written…which I began doing as soon as I got home. Fast forward to today, I have learned that my poem was accepted – and will be published in the book, Except for Love: New England Poets inspired by Donald Hall (Encircle Pub, 2019), scheduled for release on June 23, 2019, exactly one year since his passing. To say I’m honored and thrilled to be part of such an important book is an understatement. Oh, and how does all this relate to what I said at the beginning of this post? 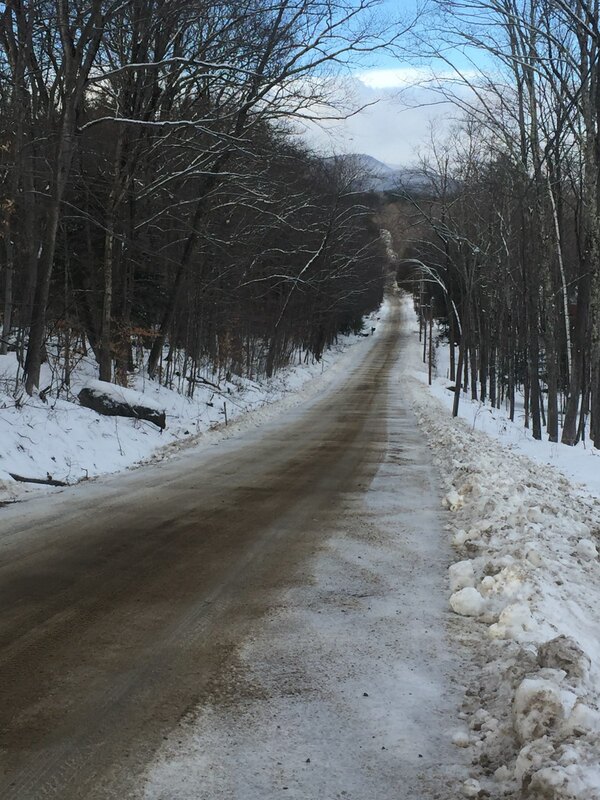 The very road that inspired my poem…with Mt. Kearsarge in the distance. That’s right. 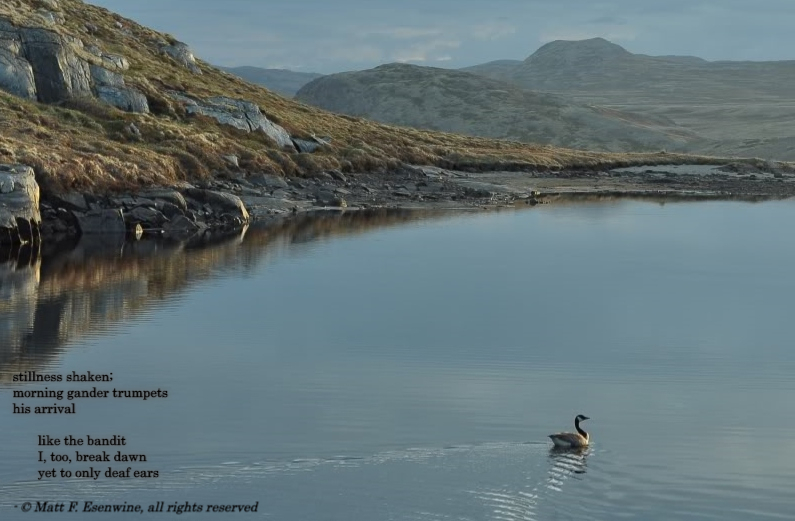 I was inspired to write a poem – a poem that will be included in a book celebrating Donald Hall – while walking along a dirt road that lay in the presence of the very mountain that is synonymous with Hall himself! Call it Fate, call it coincidence, call it Divine Intervention; I had no idea the significance of what was doing, those six years ago. I’ll be sure to share more news of the book as we get closer to the publication date. For now, if you’re looking for more poetry, head Down Under – where my Aussie friend, Kathryn Apel, is hosting today’s complete Poetry Friday roundup! By the way, I have been neglect in mentioning that I am once again a first-round judge of the annual CYBILS Awards‘ Poetry category! This means that not only am I charged with narrowing down the 60 or so nominated books down to a shortlist of SEVEN…but I also have to find the time to read as many of those books as I can. So if you wonder why I haven’t been making the rounds on Poetry Friday as much as I usually do, it’s simply because time is so precious and scarce these days. Speaking of neglecting to mention things…I’m also taking part in Tabatha Yeatts‘ annual Winter Poetry Swap, a sort of poetic Secret Santa type of thing, in which Tabatha gives each participant the name of another, and that person has to write a poem for the person and send it to him or her, often with a small gift. I’ll share the poem I wrote here, once I know the person I sent it to has received it – probably next week. 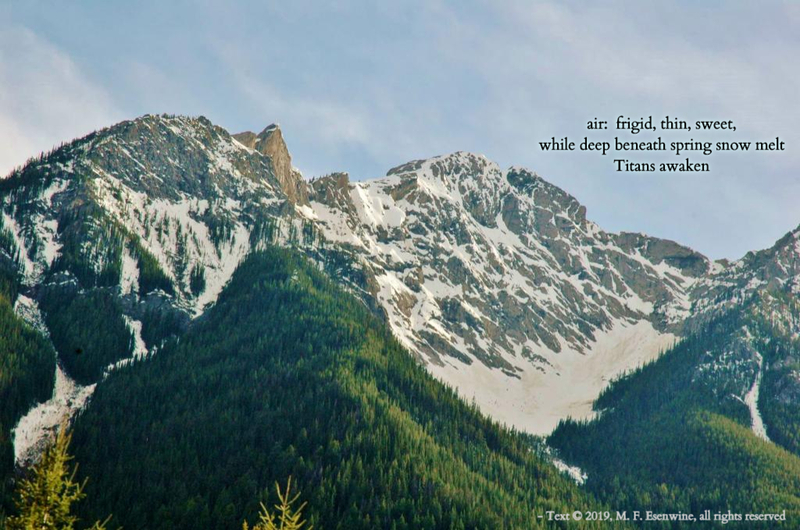 And speaking of Poetry Friday…for more poetry, be sure to visit Liz Steinglass’ blog for today’s complete roundup! You may recall that I spent a week at a Highlights Foundation poetry workshop back in October with Rebecca Kai Dotlich, Georgia heard, and a wonderful crew of writers yearning to learn more about children’s poetry. During that week, attendees were given a variety of poetry prompts to fire up our brains and imaginations, including Popsicle sticks, paint swatches, and poetic forms like concrete poetry and iambic pentameter. The latter is where this week’s poem comes from! We were tasked with writing a couplet – but when I saw the large stone wall outside the main building (The Barn, as they call it), I didn’t feel a couplet would be quite enough to do it justice. So I just started writing – and by the time we were called to share our work, I had completed eight lines. As with most poetry prompts, it’s neither polished nor perfect…but I’m sharing it because, as I’ve said here before, all poetry needs to start from somewhere, and the important thing about writing is that you DO IT. Remember my mantra: #WriteLikeNoOneIsReading! 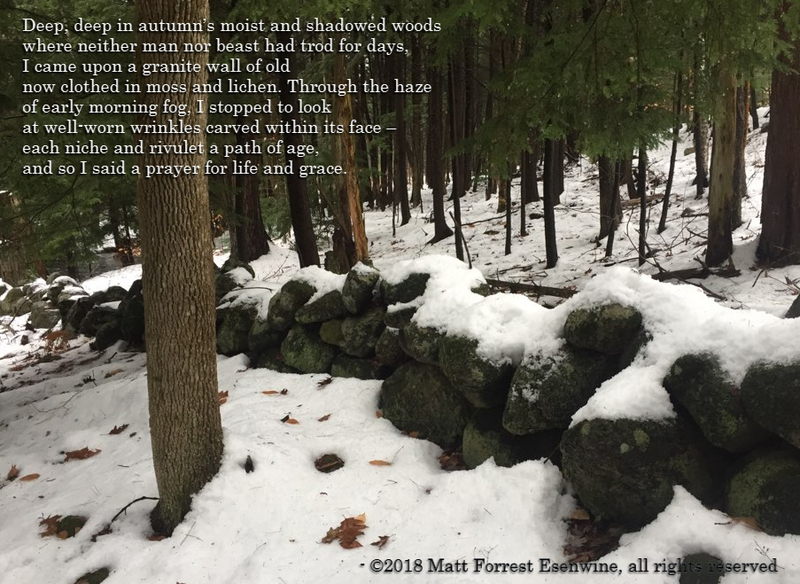 I spiffed it up a bit with a photo of a stone wall on my own property, but that doesn’t change the fact that there is much more that I could do with this poem to improve it (edit some words out, add more internal rhyme, etc. ), but for what it is, I like it, and will probably not be tackling any revisions anytime soon. 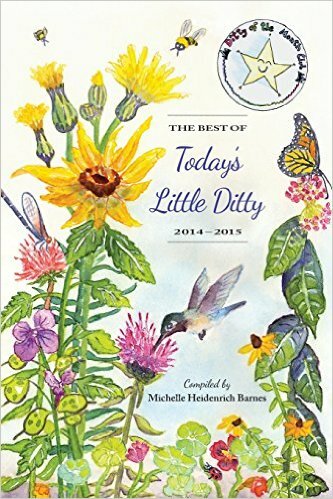 For all of today’s Poetry Friday links, head on over to Carol’s Corner for the complete Poetry Friday roundup and a review of K.A. Holt’s Knockout (Chronicle, 2018)! Poetry Friday: An Octo-poem for Agnes! Agnes, you see, is a giant Pacific octopus who corresponds with other deep-sea critters using postcards (imaginative concept, yes?). Her story, Love, Agnes (Millbrook Press, 2018), is told by Irene Latham (Dear Wandering Wildebeest, Can I Touch Your Hair?) and is available everywhere! So to celebrate, Irene is featuring octopus poems at her blog all month long. Some are touching, some introspective, others full of imagery and emotion. Ha! 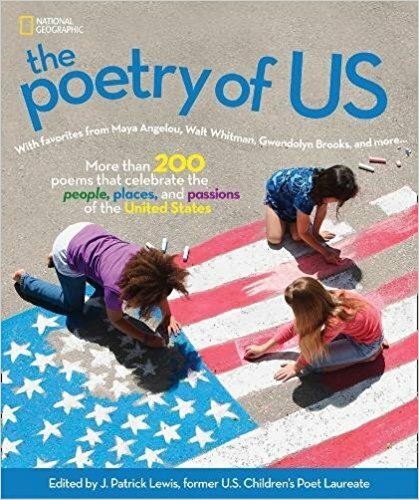 For more poetry, head over to my friend Laura Purdie Salas’ Writing the World for Kids, where she’s hosting today’s Poetry Friday roundup with one of my favorite poems from J. Patrick Lewis’ new anthology, The Poetry of US (National Geographic Children’s Books, 2018). And if you didn’t hear about the big event I got to take part in this past weekend, I encourage you to check out Flashlight Night‘s flashlight night! Going to be in the Concord, NH area tomorrow? Please consider stopping by Books-A-Million on Fort Eddy Road for their special educator day, Sat., Oct. 13! I’ll be there from 1-3pm along with fellow New Hampshire authors Deborah Bruss, Marty Kelley, and Amy Makechnie, signing books and chatting about education, writing/illustrating, and school author visits!